What happens to the lining of your uterus if you take the Pill continuously and not get a period? Does it build up? Do you not grow a lining? Posted 19 October 2016 under Ask Us. Great question! 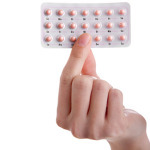 If you are NOT taking the Pill (oral contraceptive pills), each month, the lining of your uterus naturally thickens or “builds up” to prepare for a possible pregnancy. When pregnancy does not occur, your body sheds this lining, which is called “a period.” However, if you take birth control pills, the lining of the uterus does not build up or thicken. When you stop taking the Pill, you will have what is called a “withdrawal” period which happens because the level of the hormones drop. This type of period is usually shorter and lighter. I am on continuous hormonal pills so I don’t get a period. Where does the blood go? and is it dangerous not to have a period?